We worked all weekend to get the tree decorated, the house decorated and cleaned. I have to confess, I abandoned my hubby on Sunday to go and sew though. I promised a very special young lady a pair of Christmas stockings and one was partially finished with the other one just a vision dancing in my head! It is always a challenge to remember how to do that cuff! The first one is always the slowest. 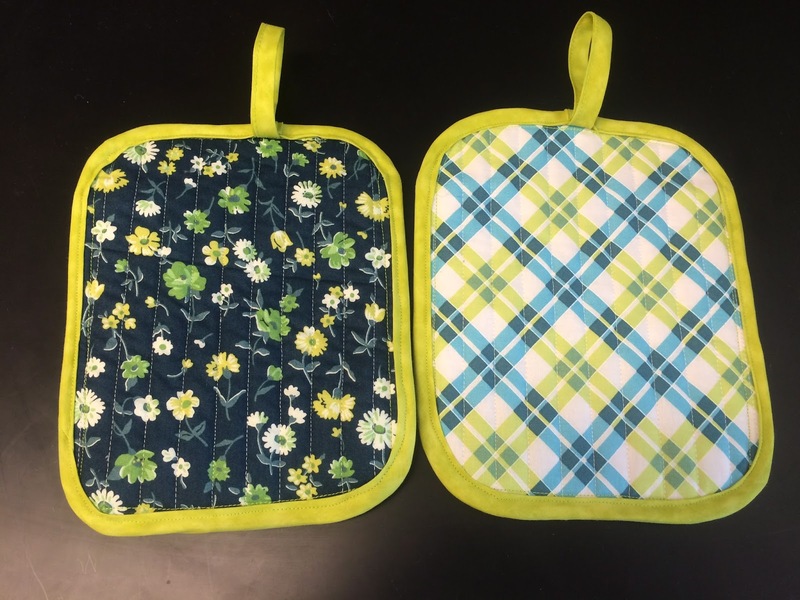 I was waffling about whether to make the second one the same as the first or different. In the end I went with a different one. Mainly because I loved that background fabric so much! It is from Kate Spain's Flurry line. I stayed up past my bedtime to finish the second one, but I was so close I just didn't want to stop! I have one more to make in blue and gold, but it will not have a name until next year. I am trying to decide whether I want to just make it now while I am in the groove or wait. but I have at least one more Christmas gift I need to make. Of course there are always more things we want to make but at some point I need/want to stop and just enjoy my family and Christmas. I think this next gift (and one more shower thing, not sewing related) is going to be the end. What last minute things are you working on? Hubby and I took off last week for a day and drove to Shipshewana Indiana. So many neat places and we had specific things we were looking for. Christmas shopping was happening, people. One of the first places we go is the Davis Mercantile. First stop is Jo-Jo's Pretzels for pretzels and there sweet mustard. I decided to look around and see if there were any purples/blues that I could use for my daughter's upcoming wedding quilt. It is, of course, peacock themed. Yes, thanks, these will do nicely. This is the pattern I am planning on trying to make. I am sure there will be modifications but this is the starting point. What is a trip to Amish country without seeing some buggies? Funny story about these "J's". 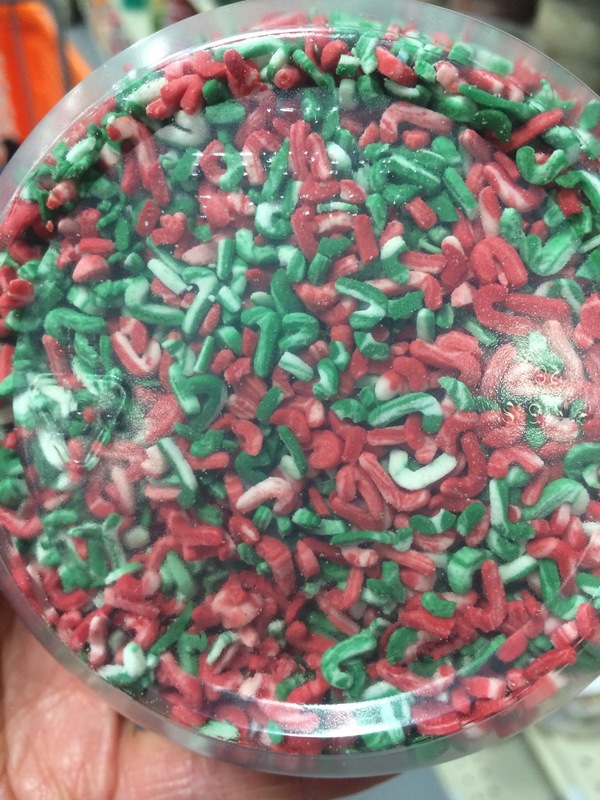 We were in the bulk food store several years ago and I was looking at the sprinkles for cakes/cookies. I had the alphabet on my mind so when I picked up this container, I looked at it for a bit and asked my husband why it only had J's in it? To which he replied, "Ah, I think those are candy canes". Well DUH, of course they were. Sheesh, my blondeness was showing. Now everytime we go one of us picks these up and remembers the "J's". LOL I hope this makes you all laugh! Which brings me to what I am furiously trying to finish for Christmas. I'm sure that from this peek you can tell what this is. I have been working on a pair of pillowcases for you know who. I am soooo close to being finished with them! I am linking up to Let's Bee Social and WIP Wednesday. Putting the bias binding on these is difficult and every time I do it I remember how much I dislike it! Autumn was being really odd while I was trying to make bee blocks last night. Doesn't she look goofy here?? 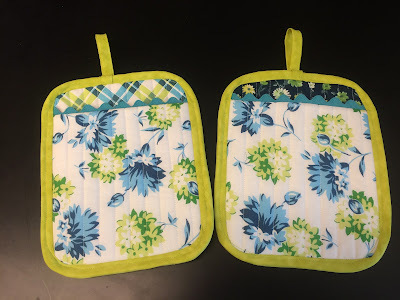 These bee blocks were super easy and turned out great! You can find the pattern here if you want to make some too. Just lounging by the machine. Now I need to send these in the mail and my December bee commitment is finished. I am well on the way to having all the bridal shower gifts ready too. 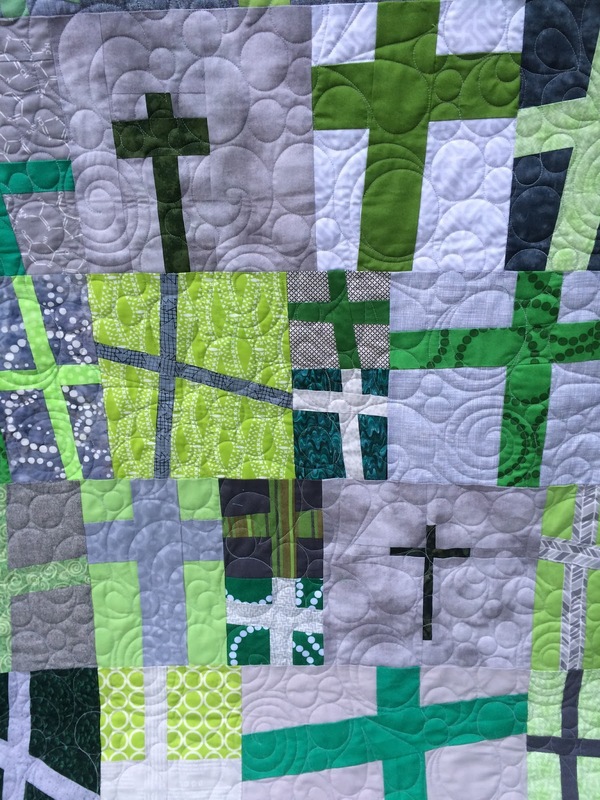 On to finish up the wedding quilt, oh and get all the Christmas things out. I had a pretty good weekend and I hope you did too. My daughter came over to have me make another peacock diaper for Beep. It seems that she has outgrown the first one I made. The pouch was not wide enough so this is the remake yet again. Then DD showed me this photo of my grand pea hen on Santa's lap! 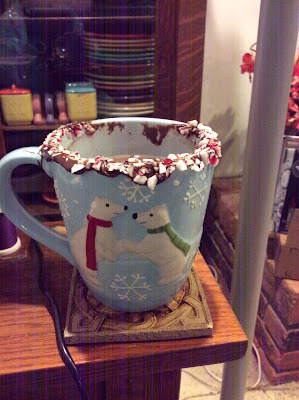 My hubby was being all secretive in the kitchen and then came out with this mug of hot chocolate. He melted chocolate and put it on the rim. Then dipped it in crushed peppermints. The mug was full of hot chocolate and marshmallows. He is too good to me! Last night I was working on finishing up some bridal shower gifts and I got up from my machine. When I sat back down this is the sight that greeted me. Autumn was poking her face through the machine to get my attention. I always worry about her when she does this. Don't want her sticking a paw where it doesn't belong!!! The bad news is that my machine began acting very strangely. I love to use my knee lifter. Last night every time I used the knee lifter my feed dogs dropped down. I have another machine that I can use, but I miss my main machine. I hope Jay can fix her. 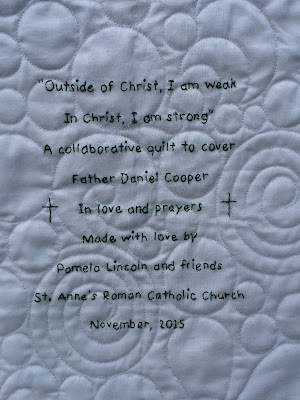 I have finished up the Bee Positive 2 quilt for Father Cooper! The binding was the last thing. I had much help with applying this! Her eyes matched the quilt! This, though, was truly obnoxious! I had to move her with the quilt! I am completely smitten with this. 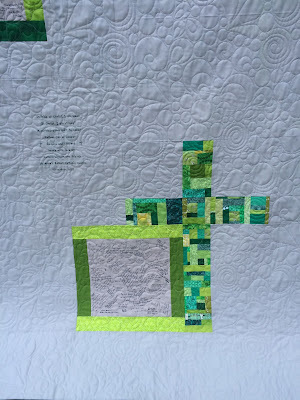 I can't wait to do a quilt along with this block! Don't forget to stop back in January for a Bee Positive Quilt Along. I hope you all are as excited as I am for this!!! I know you may not think you can do it but trust me you totally can! They are very addicting to make though so watch out. You will begin and then get lost in the process. I found it difficult to stop once I began. 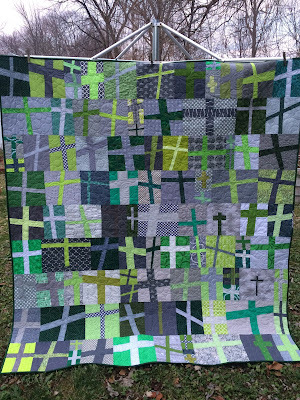 I made a few improv pieced crosses for the back and I love how they came out too. They were pretty time consuming to make but I love the finished look. I put them next to the blocks that were signed by everyone in the parish. Yes, it is a pretty small church. You can see the lay out of the entire back in this photo. I did embroider a label that I sewed into the back. As I may have already stated, I really don't like making labels so this is my new way. Embroider the label and put it into the back. No label to sew on when the quilt is finished! 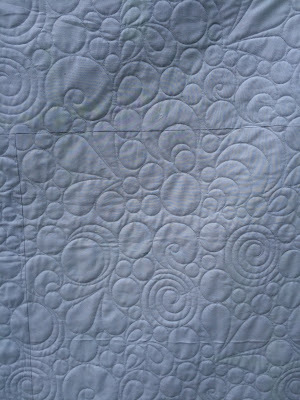 Just in case you have not noticed the spectacular quilting(done by my friend Liz) here is a close up. 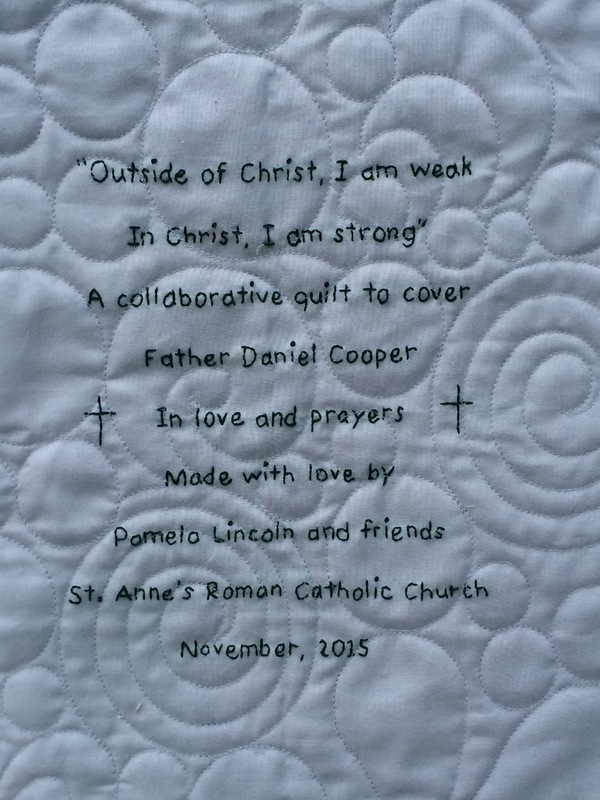 My plan is to give this to Father Cooper's mom on Sunday so he will have it soon. I am going to link up to Finish It Up Friday over at Crazy Mom Quilts. Bee Positive Quilt Along Anyone?? I have a friend that is making a quilt for another one of her friends that has cancer. She called me to tell me that she is copying off of me (LOL) and making a + quilt for her friend. 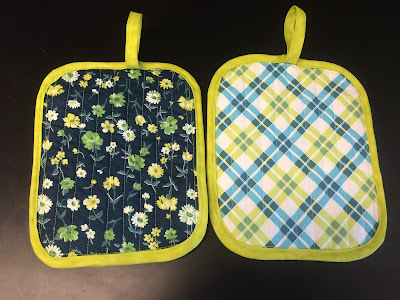 I offered to make a few blocks and send to her as they are fun to make and go together quickly. Her color scheme is purple, pink and orange. Interesting, but as it turns out really pretty when finished. Here are the 8 blocks I made for her. I posted these on Instagram and there were several people that thought this was great and wanted to know how to make them. I thought about it for a bit and it seems like there is some interest in learning the technique to make the blocks and to learn how to put it all together. I have decided that I will run a Bee Positive Quilt Along. I will begin in January and we will talk about fabric selection then. Next up will be me showing you how I build the blocks and then you are off to do this. After that we will go on to talk about assembling the rows and finally about putting the rows together. Sound like fun? These blocks would be a great way to use up scraps. You could go totally scrappy or use just a few colors. Make it bed sized or lap sized. 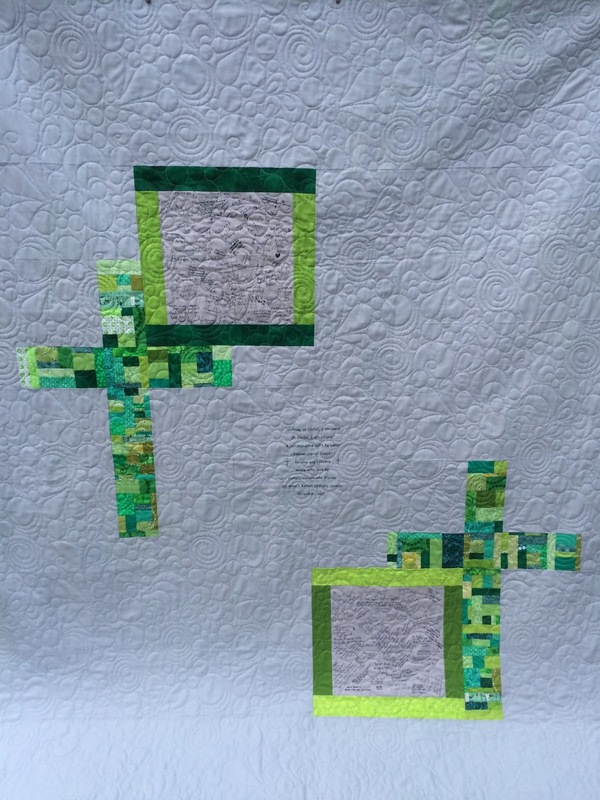 These quilts really lend themselves to charity quilts too. So after I was done making blocks I decided that extra pie crust needed to be used up. I cut out some circles, and put them in the muffin cups. I opened a can of peach pie filling and used the left over dough to cut into strips for the top. I brushed the tops with egg and sprinkled raw sugar over the top. Popped them into the oven for 20 minutes at 375 and VIOLA Individual peach pies!! Cats be like,"Hey what do you think that crazy woman is doing in the kitchen?" Pardon the dog food bag, I use this for paper recycling! 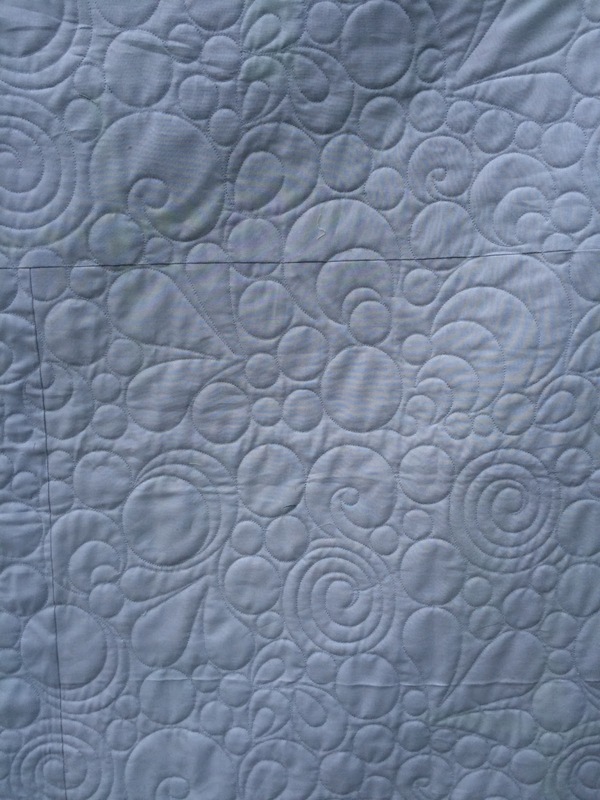 So please let me know if anyone is even remotely interested in learning this technique and how to make a great + quilt and we will make that happen in January. I have been making steady progress on the blocks for the next wedding quilt. This is the first block that I finished. I have to say I am loving the Pearl Bracelets as the background! 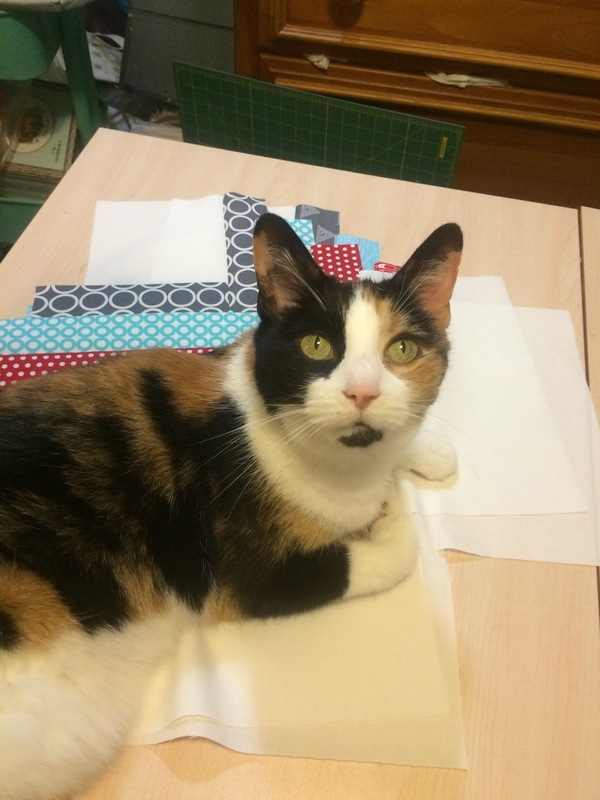 Of course, Autumn was right there, laying on all the fabric to help me! See my super cool Sparty Tervis tumbler? I went to the SA last week with hubby and he found three of them there for .99 each! That is a scream of a deal!!! I can load it up with ice and there is absolutely zero condensation on the outside of the glass. Perfect for in my sewing room. This is the second block I finished. I loved the bunny fabric in the lower left and the text print. I am always a little nervous when Autumn decides to do something like this but at least most of the rows were sewn together already! So here is the back story on this block. Amy's mom, who was also a dear friend of mine, passed away this past October. so that every time Amy used it she would think of her mom too. She dropped off a blue tee shirt of her mom's on Monday. 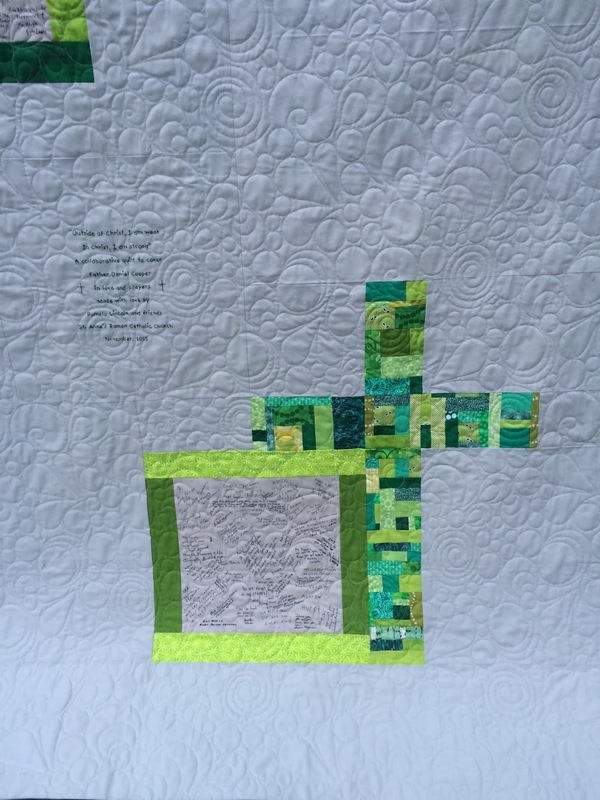 I stabilized it with some interfacing and used it to make this block. and included them in "Barb's" block. Mine has chemical symbols, as I am a scientist. My older daughter raises peafowl so her star had peacocks in it. so her block has Sebastian in it. 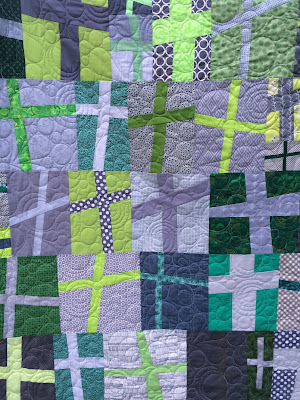 I'm pretty sure this will be my favorite block in the entire quilt! I asked for some fabric from Amy's MIL to be also and will make a star for her in another block. Amy (a teacher) so will put that into the block with the fabric from her MIL. It has been a fun way to make this personal without it being "in your face". Amy will know and so will her husband but anyone looking will just see all the beautiful stars. 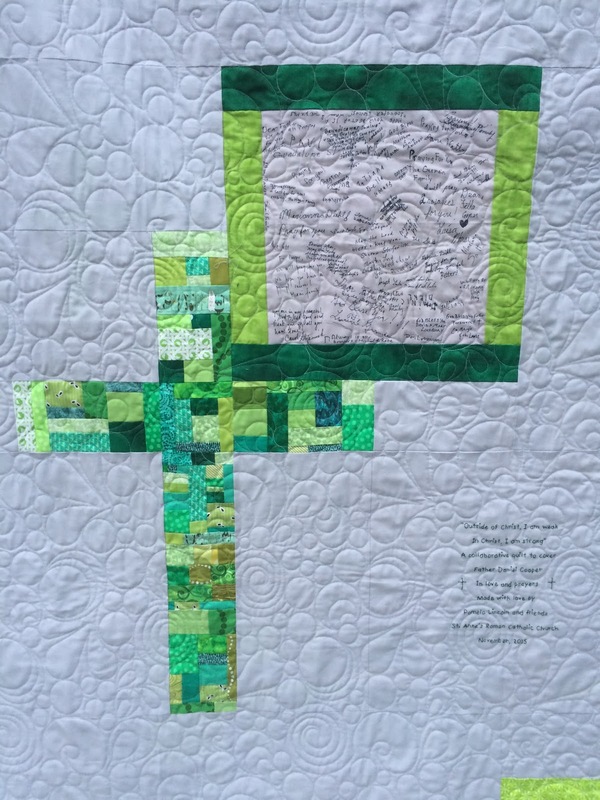 I really feel honored to be able to create this wedding gift and memory of my friend for her daughter. I am hoping to get it all together before Christmas, but we will see. 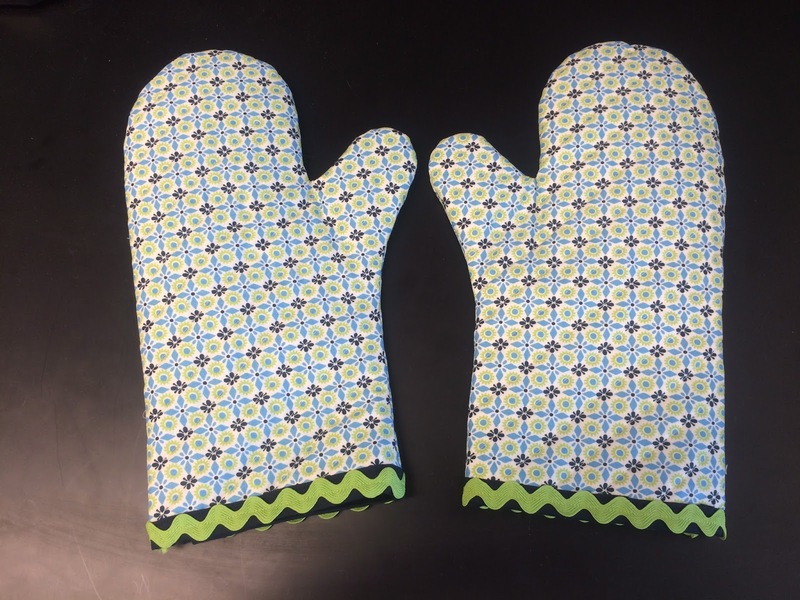 I need to make a couple of Christmas stockings and some bridal shower gifts too (shhhh don't tell Amy ). 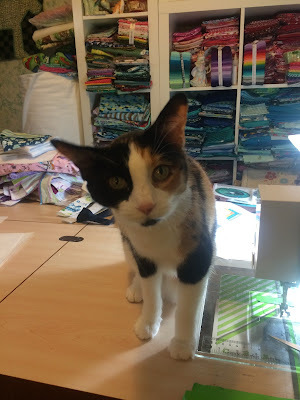 I had BIG plans to do more but this pesky job seems to keep getting in the way of my sewing!!! Linking up to WIP Wednesday over at Freshly Pieced and Let's Bee Social at Sew Fresh Quilts. What are you sewing for Christmas?? We had a wonderful Thanksgiving weekend. I hope, for those of you that celebrate it, that you did too. This is what the "pre" Thanksgiving table looked like. It was a pretty typical Thanksgiving day with all but one of my kids home. The dog and the peahen seemed to enjoy the festivities! 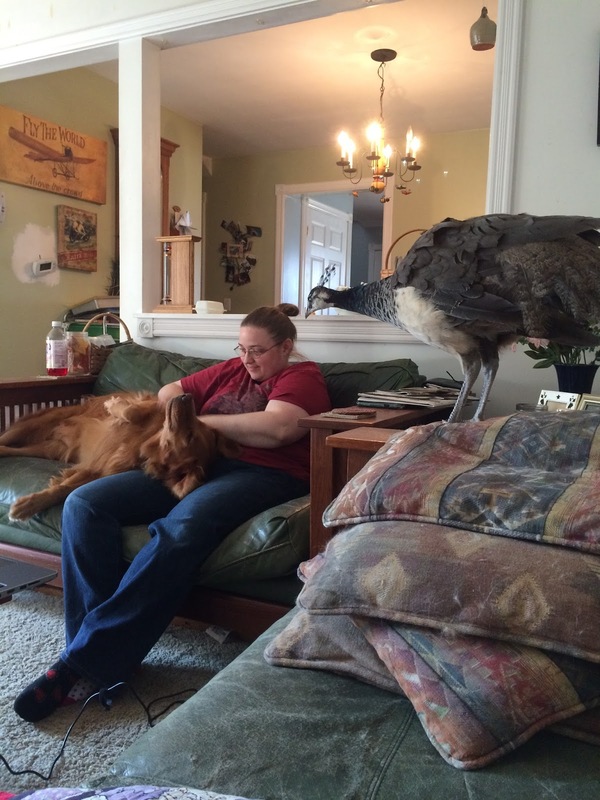 Doesn't everyone have a house peahen? Of course the superstar of the weekend was our turkey. You may have seen the photo of my husband wrestling with this monster in an earlier blog post. Out daughter raised several turkeys this year. This was our spread for dinner. Everything was so good. 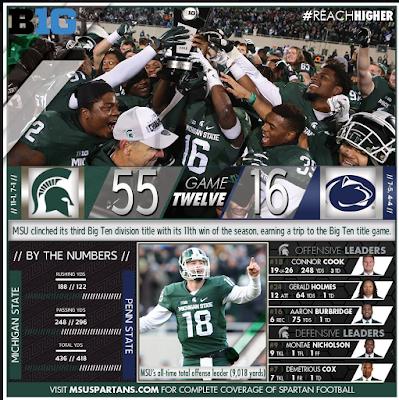 now on to the game against Iowa for the BIG championship game!! I did manage to sneak in a little sewing too but will save that for another post! How did you enjoy the long weekend?